If you first place a flannel fitted cover over the face rest pad, the disposable cover will stick to the flannel and not shift position as it does on the slick face pad upholstery. 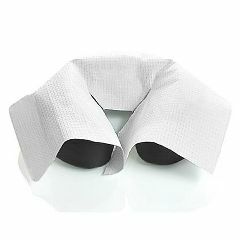 Provide a comfortable and sanitary surface for your clients with these dispoable headrest covers. Just throw it away when your client leaves and put a new one on for the next client - how easy is that? And, your washload will be smaller! Permanent mascara and make-up marks on your nice flannel covers? This is the solution! Disposable covers are a great way to cover the face rest cushion when doing lots of massages and reduce the amount of linens to be washed. This case of 1000 disposable covers is great for chair and table massage.